Pepper was designed from the beginning to offer high levels of customer service. Pepper is already being used in several offices around the UK as a receptionist, offering a consistent and reliable first point of contact for businesses. Pepper isn’t just suited to desk-work, however. Pepper offers a high degree of interactivity, which makes it the ideal choice as an addition to your next event or trade show. Customer service relies on interaction, and interacting with Pepper is a joy. Pepper’s facial recognition technology means that repeat guests, visitors, and customers are welcomed by name. Pepper also offers superior functionality by being able to send meeting alerts, store organiser and scheduling data, as well as being configurable with your unique business branding. Pepper makes a wise choice for anyone considering robot hire because of the incredible technology found within. 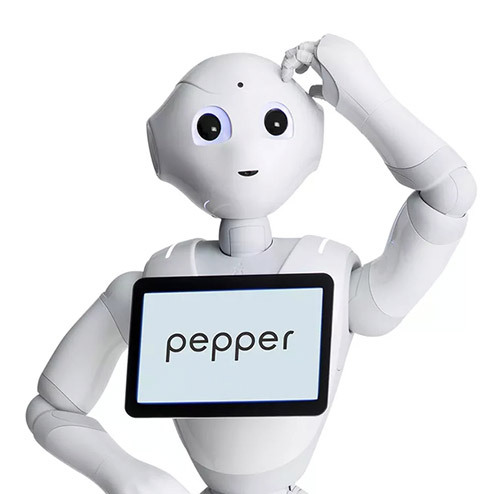 Designed from the ground up to be a dedicated service robot, Pepper has four microphones within the head in order to accurately pick up and register vocal interactions. A HD camera in both Pepper’s mouth and forehead allow for facial recognitions, while behind the eyes lies a 3-D depth sensor to register proximity. A gyroscope in the torso allows Pepper to be a highly stable robot, which makes it the ideal choice to wander the floor of an event or show, rather than being confined behind a desk. Movement is further aided via two sonar, three bumper sensors, six lasers, and an additional gyroscope in the mobile base – all providing further stability, and allowing Pepper to avoid impacts. Pepper is the culmination of years of dedicated design and development, resulting in a service robot that consistently improves engagement with customers and visitors alike. Pepper can wander the floor of your event, recognise guests, and provide branded information about your business in a professional and always friendly manner.